Sixty-five years since the end of World War II, and one year since the Democratic Party of Japan came to power, redress campaigns for forced labor in wartime Japan are bearing promising fruit and entering a decisive phase. Mitsubishi Heavy Industries (MHI) surprised many observers last month by announcing it will start talks on compensating the 300 Korean women who were deceived as teenagers into toiling without pay at a Nagoya aircraft factory. The so-called teishintai (volunteer corps) workers lost their lawsuit at the Japan Supreme Court in 2008, but last December the Japanese government issued seven of the women refunds of a mere ¥99 for pension deposits withheld during the war. That move led to a petition signed by more than 130,000 South Korean citizens and 100 members of the National Assembly demanding that MHI apologize to the women and properly compensate them — and to credible threats of consumer boycotts if the company fails to do so. It may prove difficult for Mitsubishi, possibly Japan’s largest user of wartime forced labor, to compensate the Korean women on a “humanitarian basis” while refusing similar demands from thousands of other Korean labor conscripts or their descendants. Other Japanese firms that profited from labor conscription will likely feel renewed pressure to settle redress claims. Last March, the Japanese government broke with six decades of secrecy by supplying the South Korean government with name rosters and payroll records for 175,000 Koreans coerced into working for private companies in Japan. The records include details about the ¥278 million (roughly $3 million, unadjusted for interest or inflation) in wage arrears and related benefits that labor conscripts earned but never received. Today the money sits in the Bank of Japan (BOJ); Japanese employers transferred it there soon after the war at the government’s direction. South Korea waived all rights to the funds under its 1965 treaty with Japan, but officials in Seoul are now using the data to verify the historical record of forced labor. A 2007 redress law authorized fixed-amount payments from South Korean coffers to former conscripts and family members, as well as individualized payments based on the BOJ financial deposits. Japan has never indicated what it ultimately intends to do with the unpaid wages. “Unless the South Korean government seeks a solution to the financial deposits issue more proactively, the Japanese government will not act” to release the funds, according to Ken Arimitsu, executive director of the Tokyo-based Network for Redress of World War II Victims. Arimitsu’s group is currently pushing for the return to Korea of cultural properties taken to Japan during the 1910-1945 colonial era, but he said Diet legislation is needed to resolve the vast problem. More than 60,000 Korean cultural assets, some of them considered national treasures, are now being exhibited in Japan, according to a report produced this year by the South Korean government. Earlier this month Prime Minister Naoto Kan expressed his “deep remorse and heartfelt apology” to South Koreans for the “tremendous damage and sufferings” caused by Japanese colonial rule, which was “imposed against their will.” Kan also promised Japan will return Korean royal documents now in the possession of the Imperial Household Agency. Continuing a process begun in 2008, the remains of 219 Korean military conscripts killed in the war were repatriated from Yutenji Temple in Tokyo to South Korea on May 19. Foreign Minister Katsuya Okada represented the Japanese government at the Yutenji memorial service for the first time. A total of 204 sets of military remains had been sent home on three previous occasions, but with only Japanese vice-ministers in attendance. Japan has been paying for South Korean family members to attend the memorial services in Tokyo, and making condolence payments of about $300 per fatality. But details about the conscripts’ battlefield deaths have been withheld from the public on privacy grounds. The final 275 sets of remains slated for return to South Korea belong mainly to women and children killed in the (most likely accidental) explosion and sinking of the Japanese transport ship the Ukishima Maru near Kyoto one week after the war’s end. There are currently no plans to return the 427 sets of Yutenji remains of those who originated in what later became North Korea. In fact, Japan’s ongoing string of conciliatory gestures has pointedly excluded North Korea, mainly due to that country’s nuclear weapons program and past abduction of Japanese nationals. Yet when North Korea someday sits down with Japan to normalize ties, Pyongyang will seek reparations for colonialism from a bargaining position stronger than that of South Korea in 1965, when the existence of the conscription- linked cash in the BOJ and the “comfort women” system of military sexual servitude was virtually unknown. Around 700,000 Korean civilians were conscripted into working for private companies in Japan and about 300,000 military conscripts were mobilized overseas. Roughly 40,000 Chinese and 35,000 Allied prisoners of war also performed forced labor in Japan, while millions of Asians and Westerners worked without pay under miserable conditions elsewhere in the Japanese empire. Six American former POWs, some of them survivors of the Bataan Death March, are scheduled to make an eight-day goodwill visit to Japan in September as part of a Tokyo-funded program to “promote mutual understanding.” It is the first time Japan has invited Americans to join the reconciliation trips, which in past years have included former prisoners from the other major Allied nations. The Japanese government has budgeted ¥18 million for such visits by American ex-POWs and ¥12 million for visits by Australian ex-POWs in 2010. But the reparations movement for Chinese forced labor is inching closest to success, thanks to a pair of landmark out-of-court settlements by Nishimatsu Construction Co.
Last October Nishimatsu set up a ¥250 million fund to compensate the 360 Chinese forced to build a hydroelectric plant at Yasuno in Hiroshima Prefecture, while a fund of ¥128 million was set up last April to compensate the 183 Chinese who performed similarly backbreaking work at Shinanogawa in Niigata Prefecture. Both settlements included apologies and payments to victims or their heirs, since the great majority of workers have already died. The agreements stemmed from the April 2007 victory for Nishimatsu at the Japan Supreme Court, which ruled that the 1972 Japan-China Joint Communique extinguished the right of Chinese individuals to file lawsuits for war-related damages. Echoing lower courts in related cases, though, Japan’s top court also found that Nishimatsu and the Japanese state jointly operated an illegal forced labor enterprise at the Shinanogawa work site — and recommended nonjudicial “relief” for the Chinese victims. 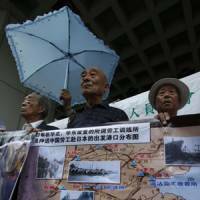 But the day after the Nishimatsu Shinanogawa accord was finalized in April, the five plaintiffs in the failed lawsuit announced at a press conference in Beijing that they were rejecting the pact and considering legal action in China. Late in the process of hammering out the settlement, the plaintiffs’ team of Japanese lawyers began negotiating with Nishimatsu on behalf of a larger group of Shinanogawa victims who had not participated in the lengthy litigation. Kang Jian, a Chinese attorney who has played a key role in 13 war-related lawsuits across Japan, strongly backed the five plaintiffs in turning down the Nishimatsu deal. Kang castigated the company for playing “word games” in refusing to admit legal liability for forced labor, even though the Japan Supreme Court ruled that no legal liability exists, and for failing to describe the compensation as “damages.” Her charges were widely disseminated in the Chinese media. Japanese attorney Toru Takahashi called it “extremely regrettable” that the Chinese plaintiffs ended up rejecting the Nishimatsu settlement. He explained that the Lawyers Group for Chinese War Victims’ Compensation Claims, which since 1995 has litigated dozens of lawsuits in Japan on a pro bono basis, had always implicitly worked on behalf of the entire group of Shinanogawa victims because Japan does not permit class action suits. “We think moral and historical responsibility is heavier than legal responsibility,” Takahashi said of the divergent legal perspectives. In the 2010 pact, Nishimatsu recognizes its corporate responsibility for “forced labor,” apologizes with “deep reflection” and commits to per-capita payouts of just over $7,000 — a figure slightly higher than in the company’s 2009 agreement with workers from the Yasuno site. More importantly, the Shinanogawa compensation program is being administered by a Chinese foundation for the first time. 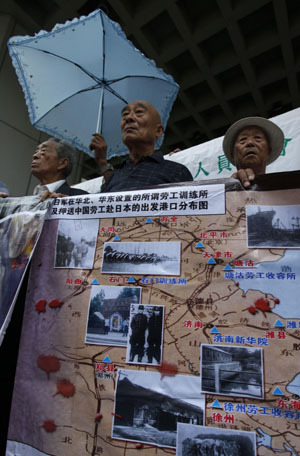 The five plaintiffs who refused the deal, mainly family members of victims who died during the lawsuit, are being compensated by private Chinese donors. Both Nishimatsu agreements are clearly better than the 2000 settlement between Kajima Construction Co. and survivors of the Hanaoka work site where 418 out of 986 Chinese workers perished, some of them tortured to death following a full-scale riot and mass escape. Kajima did not apologize or admit to any wrongdoing in the text of that settlement, while individual payments of barely $2,000 doled out from within Japan produced much recrimination and mistrust. The lead plaintiff in the Hanaoka lawsuit and some other victims ended up refusing Kajima’s cash but accepting money from private Chinese sources. Takahashi said his attorneys’ group plans to start visiting the roughly 20 other Japanese firms still in existence that used Chinese forced labor this summer, searching for signs of any Nishimatsu knock-on effect. Several companies have privately expressed interest in settling claims, according to Takahashi, while others continue to insist that all war-related issues have been resolved. Not only did Japanese industry profit from having a Chinese workforce that was apparently never paid during the war, but companies were also generously reimbursed by the Japanese state soon after the war for the supposed costs of the brutal labor program. The lawyers’ organization hopes a critical mass of Japanese companies will first come to view resolution of the Chinese forced labor issue as being in their self-interest, and will then help persuade the Japanese government to set up a comprehensive state-industry framework for compensation, just as Germany did in 2000. This sense of corporate self-interest would be piqued if the so-far-ambivalent Chinese government were to allow Japanese companies to be sued for compensation in Chinese courts. The public relations fallout would likely push companies like Mitsubishi Materials to the negotiating table even if the suits were never actually adjudicated. Mitsubishi is today a prime target of attorneys’ and citizens’ groups in both China and Japan, as the global mining firm has indicated its willingness to settle Chinese forced labor claims on the condition that the Japanese government participates in the process. Japanese Transportation Minister Seiji Maehara visited San Francisco in June to promote the nation’s bullet train technology, and has invited California Gov. Arnold Schwarzenegger to visit Japan in September to negotiate rail deals directly. As the proposed World War II law would also require companies to describe any postwar reparative actions, it could put Japanese businesses at a distinct disadvantage in the bidding process. Of the hundreds of Japanese companies that used Asians and Westerners for forced labor, only a tiny handful has ever acknowledged the historical reality or sought to make amends. Japan’s central government, even under the relatively progressive DPJ, has never built a single memorial for the thousands of forced laborers who died in Japan.